Lay the fish fillets skin-side up on a metal dish (I use a roasting tray). 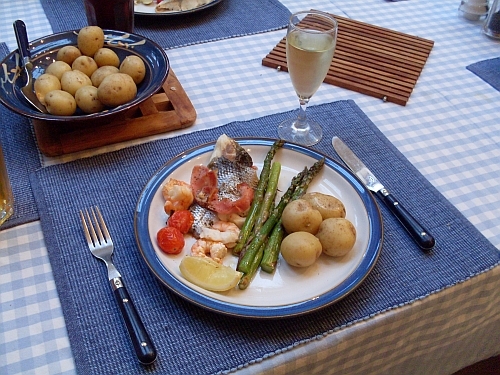 Arrange the asparagus, tomatoes and lemon around the fish. Put the bacon randomly on top. Sprinkle with torn basil leaves, salt and pepper, and chilli if you are using it, then drizzle with the olive oil. Set your grill on full whack and put the tray under it, about 10-15 cms away from the heat. Keep an eye on it for 10 minutes, if it is looking too charred move it down a bit. After 10 minutes put the prawns in the dish, and grill for a further 10 minutes. That’s all you have to do! Serve with new potatoes, and pour over the sauce from the pan. A glass of white wine washes this down very nicely.